Disney's Hollywood Studios has some special treats especially designed for observant and curious Disney World guests. 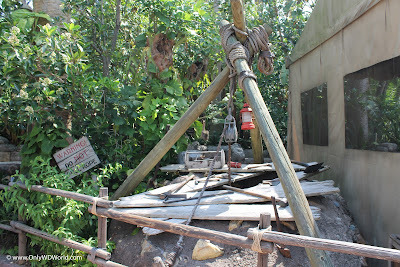 One of the best Disney World Hidden Secrets can be found next to the Indiana Jones Stunt Spectacular main entrance. To the left of the entrance you will find a lashed together tripod over top of a construction scene with a rope that descends into a hole out of view. To the left is a sign with the words "Warning! Do Not Pull Rope." 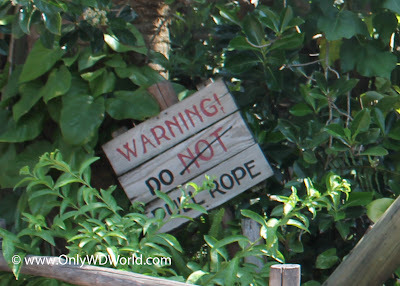 Clever Disney World Guests will take this sign as a key that they are actually supposed to "Pull The Rope!" Those that do are rewarded with a treat by triggering a voice from within the well asking for help. The dialogue actually goes on for quite a while and it is quite entertaining. This fits totally within the theme of Indiana Jones and its archaeological digging roots. The Disney Imagineers have designed this totally unadvertised mini-attraction and placed it here for guests to find. This is just one of many Disney World Hidden Secrets that the majority of Disney World Vacationers never notice or even realize they exist. Often people are in such a hurry to get to the next ride or show that they totally miss these special touches. Don't miss out on this Hidden Secret during your next Disney World Vacation. Make sure you slow down enough to notice some of the amazing details and enjoy the benefits of "Pulling The Rope!" 1 comments to "Disney World Hidden Secret: Pull The Rope! At Disney's Hollywood Studios"
Thanks for the post. I was not aware of this. It's amazing that you can visit WDW many times and still not see everything.